The protection of the homeless in Ontario is every citizen’s responsibility. This was the message in the five-person jury’s verdict in the Grant Faulkner inquest between June 11 and 15. One that a coalition – made up of RNAO, people with lived experience, community service organizations and health-care professionals – participated in. Grant Faulkner was a homeless 49-year-old man who died of smoke inhalation on Jan. 13, 2015 when his scrap wooden shelter caught fire in an industrial area of Scarborough. Prior to his death, Faulkner was sleeping in tents, make-shift shelters, and sometimes with friends while trying to live on about $220 per month in social assistance payments. 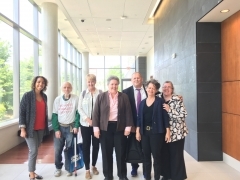 Through our legal counsel – the Advocacy Centre for Tenants of Ontario – RNAO was able to be ask questions and prepare recommendations during the inquest. - Consider zoning that might increase the availability of housing, such as rooming houses, inclusionary zoning, laneway houses, single family use conversions, etc. This is the first time in more than a decade that the Coroner’s Office has held an inquest into the death of a person experiencing homelessness. Special thanks to RNAO member and street nurse Cathy Crowe and Patient and Public Engagement (PPE) council member Mike Creek whose compelling testimony as witnesses provided critical evidence and helped inform the jury’s recommendations.